Home » News » How to trade Google shares: Will the search engine help you? How to trade Google shares: Will the search engine help you? In terms of organization, Google is a subsidiary of Alphabet Inc. Google as such offers dozens of services while Alphabet Inc. focuses on other industries e.g. autonomous cars Waymo, provider services Fiber or investment funds. The structure may appear to be overly complicated but a deeper insight into the Group is worth it. Its price, growing each year by more than 30%, is a clear proof. Google is not just a search engine! 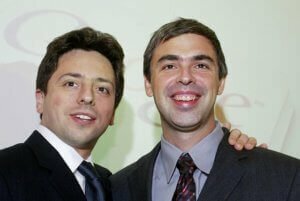 Larry Page and Sergey Brin founded Google in California (U.S.A.) in 1998. Hard to say whether when laying the foundations they anticipated their future business or business potential. Nowadays, it seems that all people know and most people use Google for surfing the Internet. People using other search engines know Google at least thanks to Android, Gmail, Street View, Google Drive or numerous other services of which Google is a provider. For example, Google has an organization making Nexus phones. Google Home helps control consumer electronics. Google offers Google Apps, price affordable virtual reality called Cardboard and much more. When you focus on Google in more detail you can be sure that you will always reveal something you did not know about Google or having something to do with Google. Did you know that Google is part of Alphabet Inc? And what does it mean for Google? Nothing substantial. The only difference is in the name i.e. using Alphabet Inc. (GOOG) instead of Google when trading Google shares. Larry Page and Sergey Brin are co-founders of both Alphabet and Google. After several acquisitions, the two businessmen decided to enter other segments and merged the acquired companies into a single conglomerate. They established a new company called Alphabet, part of which is the mentioned Google. Since all parts under the umbrella of Alphabet are traded at stock exchange as one organization, traders should consider all Alphabet segments because this may impact the price of the shares. As to Google’s position at Alphabet, Google has the main say. Google is the source of income funding other projects. Google’s contribution to the overall operating profit of Alphabet was USD 6.7 bn. The rest of Alphabet generated a loss of USD 600 million. The value of shares of Google (later Alphabet). How to trade Google shares? Google has diversified the risks by investing in new trends and seeking potential in loss-making areas. To trade Google purely based on individual sections would be very difficult if not impossible. Therefore one must focus on global information. As a large corporation, Google could not eliminate all the emotions associated with trading, which is exactly we need to know. It is the same case as Apple shares. Trading of Google shares is possible purely based on the published financial results. Interesting are also some litigations such as a recent court decision in Russia under which Google “will no longer demand exclusivity of its applications on Android devices in Russia, and it will not restrict the pre-installation of any competing search engines and applications“. This is exactly the kind of news that moves the markets. The shares of Google (or Alphabet) are experiencing a growing trend. Using a simple rule „trend is your friend“ one can recommend trading by following the trend. If you wish to hedge your investment engage in trading binary options. Binary options represent a suitable alternative – not only for beginners. The main benefit is that we know the risk and maximum profit and loss before entering the trade. A curious thing about it is that the one who can help you choose an efficient strategy for trading binary options is Google. Google as a search engine will give you information for turning your investment into a profitable undertaking. Additionally, binary options enable trading with as little as one dollar. Well, why shouldn’t we try it? Where to trade Google shares? Google (Alphabet) shares can be traded with IQ Option with a minimum investment of 1 USD. For trading Google shares you can use one of the binary options trading patterns. You do not have to buy or sell only, binary options offer more opportunities. And if you want to see which of them is the best use your demo account; it will not cost you anything. If you feel that the corporation with such a broad scope is a big bite for you, minimize your risk by trading binary options. The above text is not an analysis of investment opportunities or recommendations. The text does not comply with Act no. 256/2004 Coll.., (ref. Capital Markets Undertaking Act) regulating rules for the analyzing of investment opportunities or recommendations.